Do you remember that feeling of being a child and freewheeling your bike down a hill? It’s a giddy, carefree feeling. You’re flying but you’re in control as the wind soars through your hair and everything around you whizzes past in a blur. You grip your handlebars tightly as your heart leaps into your mouth while you lean into a corner and continue to fly. You hear nothing but the wind and the laughs and shouts of your friends around you and by the time you reach the bottom of the hill your cheeks are aching through your smile. It’s a wonderful feeling and it’s something I got to experience again during my time in Norway – only on epic proportions! This was much more dramatic than cycling home from the park with my mates. I swapped my little purple bike for a heavy-duty mountain bike with disk brakes and fat tyres and I headed out on a downhill mountain biking adventure through the epic scenery of the Norwegian fjords. 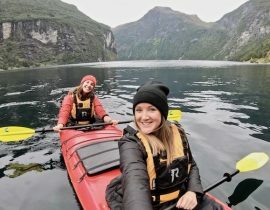 I was in Norway with P&O Cruises to experience some of the shore excursions available to their cruise passengers when visiting the Norwegian fjords. 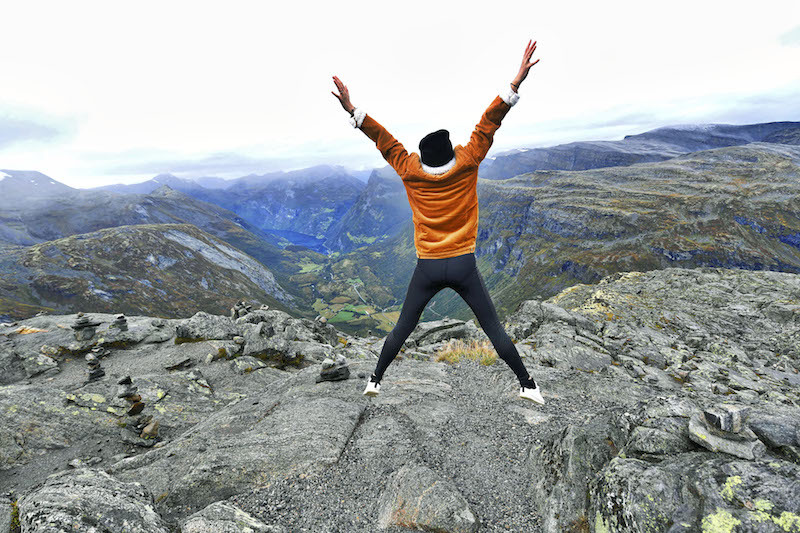 We started by visiting Geiranger Skywalk at the top of Mount Dalsnibba, a mountain in Stranda in the Geiranger valley. There’s a viewing platform at the top with incredible views from 1500 meters high! The road up to Mount Dalsnibba is one of the National Tourist Routes of Norway and this road alone is worth visiting. It snakes through the landscape and you can see the snowy peaks and epic drops from every hairpin bend. Travel Hack Tip: If you suffer from motion sickness then I recommend getting some travel sickness tablets for the drive. It was cold when we reached the top, so we quickly admired the views and took some photos before jumping back on our bus to travel down to where our mountain biking tour began. We were kitted out with mountain bikes, helmets, gloves and high visibility jackets and had a quick safety briefing before heading out. We were a small group so had one leader at the front and a safety car at the back. The road was pretty steep so I was nervous at first as my bike quickly gained speed and all my concentration was on the bike. But I soon relaxed into it and started to love the thrill of flying down the mountain. It wasn’t long before I was relaxed enough to look up and take in the views. And wow, what a view it was! There were snowy peaks in the distance and enormous mountains and towering rocks all around. The roads twisted through the scenery and there were plenty of places to stop and admire the views along the way. We stopped at Flydalsjuvet before jumping back on our bikes to continue the ride down the hill. It was raining by this point and I was starting to get cold (the only downside to a downhill bike ride is that you don’t have to pedal so it gets cold after a while!) so I took my hands off the brakes and sped down the mountain. I seriously felt like a 10 year old again as I freewheeled down the hill with rain water spraying behind me and the biggest grin plastered across me face.